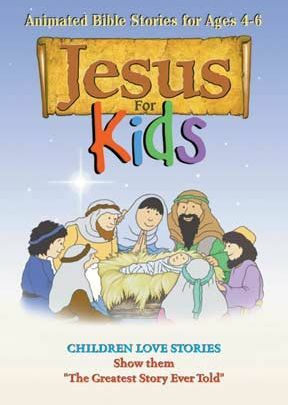 Use this five-part series to introduce your children and grandchildren to Jesus. If you are a parent or a grandparent, you are aware of the amazing capacity of small children to learn at a fantastic rate. They will pick up a lot you might wish they didn't. So don't miss the opportunity to insure they also are exposed to the most important sources that will deeply imprint their young hearts and minds for a lifetime. Acquaint them early with the greatest life ever lived, the greatest words ever spoken, the brightest hope humanity ever was given. The delightful animated stories of Jesus are based squarely on the Gospels. They are geared for children 4-6 years old. A companion guide in PDF format is included on the DVD. Fullscreen. Includes English and Spanish language tracks. This is a great video The short segments are perfect for young minds. The gentle story telling approachalong with the peaceful animations are very well done. I have used it over and over. Kids love it. Keeps true to the Gospel without uneccessary embelishment. Wish that more videos like this were available.